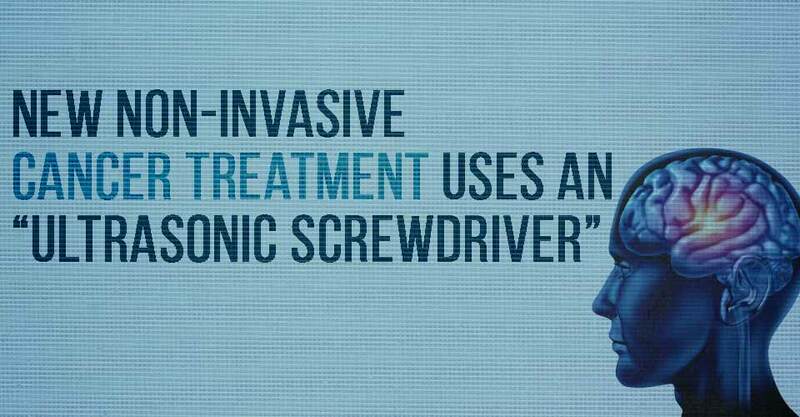 New Non-Invasive Cancer Treatment Uses an "Ultrasonic Screwdriver"
One of the toughest aspects of treating brain tumors is getting to them. Many times tumors in the brain are considered “inoperable” because of the damage that would be done to the brain to surgically remove the tumor. Researchers in Toronto believe that they have found a new method to treat tumors in the brain with more efficiency and less damage than ever before. They describe the technique as an “ultrasonic screwdriver” that penetrates the blood-brain barrier to deliver chemotherapy and medication to tumors that were previously unreachable. The blood-brain barrier is our body’s natural defense against pathogens in the blood reaching the brain. As effective as the barrier is at keeping out the bad things, it also prevents things like medication from reaching the brain. Breaching the blood-brain barrier generally means destroying the lattice-like network that comprises the barrier, doing more harm than good. That’s where the Canadain breakthrough comes in – with this new method of breaching the blood-brain barrier, the barrier is left undamaged after the procedure. The technique was originally conceived at the Pitié-Salpêtrière Hospital in Paris and involved placing ultrasonic sound emitters in the brain. Once the emitters were implanted in the patient’s brain, the patient was then injected with a mixture of chemotherapy drugs and “microbubbles”. When the ultrasonic emitters were then activated, the microbubbles expanded and contracted roughly 200,000 a second, bumping up against the blood-brain barrier and allowing the medicine through. The results were promising, but the original technique wasn’t precise and still required an invasive surgery to implant the emitters. A new version of the treatment has been developed by Dr. Todd Mainprize and Dr. Kullervo Hynynen at Sunnybrook Hospital in Toronto. The new treatment is much more precise and absolutely non-invasive. In the new treatment, the same microbubbles and chemotherapy drugs are used, but instead of internal emitters an MRI is used to target the tumor and ultrasonic beams are emitted from outside the body. The area of the brain the is affected by the ultrasonic bubble bombardment is much smaller than the original French treatment, and much more precise. Human trials are already underway for the treatment, and so far the results are as promising as the French trial, with none of the side-effects.